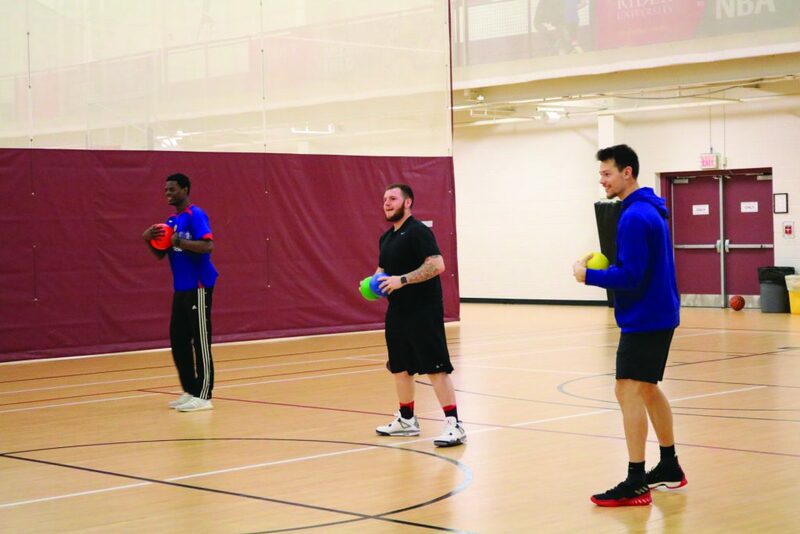 Students took on the top talents of the Rider Intramural Dodgeball Team during “Beat the Pros,” a tournament held on April 10 in the Student Recreation Center Courts. The four students behind the idea were junior management and leadership major Gabby Orszulak, senior marketing major Justine Collier, senior public relations major Brittney McEachern and senior communication studies major Kara Winkler. For their semester-long project in Associate Journalism Professor Aaron Moore’s COM 280 course called Issues in Event Planning, the students were assigned to create and host an event. Orszulak and Collier worked together extensively in the past, serving as co-chairs on the Relay for Life committee. The two were responsible for overseeing smaller committees that helped plan the entire Relay for Life event on March 30. Once the two were paired in the same group for their class, they decided co-sponsoring an event for Rider’s Relay for Life would not only be beneficial for their project, but the cause, as well. Proceeds from “Beat the Pros” went directly to the American Cancer Society through Rider’s fundraising efforts. To participate in the event, players had to pay one dollar and form teams of five. The winning players won a variety of prizes and two boxes of pizza. The “pros” in this competition were the winners of the Intramural Dodgeball tournament this past fall, according to Orszulak. Collier said that planning “Beat the Pros,” while also preparing for Relay, proved to be challenging, but also, rewarding. After the group’s planning efforts, the turnout of the event was not as successful as they hoped. As a result, the group rearranged the single five-person team into four smaller teams to accommodate the amount of players that signed up. Orszulak and Collier attributed the timing of the event to the lack of student participation. However, both Orszulak and Collier agreed that, although the outcome of the experience was not what they expected, they learned valuable lessons which will help them in their event-planning endeavors going forward.